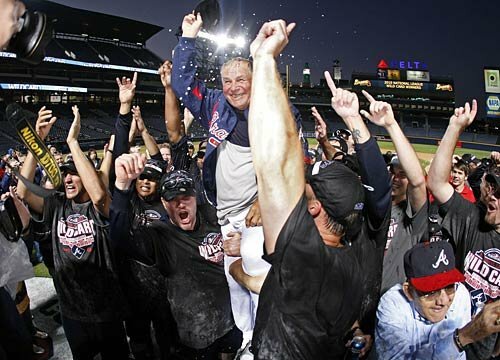 An Opinion On Sports: Atlanta Braves: Wild Card Winners! It does not matter how a team gets into the playoffs. The main thing is to get in. Period. The Atlanta Braves are indeed in, by virtue of the Wild Card spot. They will open Thursday night in San Francisco against the Giants. It is true that the Braves are 'limping' into this post-season because they carry with them injuries galore. However, when you get into a short series, anything can happen. Especially if your starting pitching holds up and you get some timely, clutch hitting. So Bobby Cox has the deserving opportunity to lead his Braves into post-season play one more time. He's earned this trip, and so has his over-achieving club.